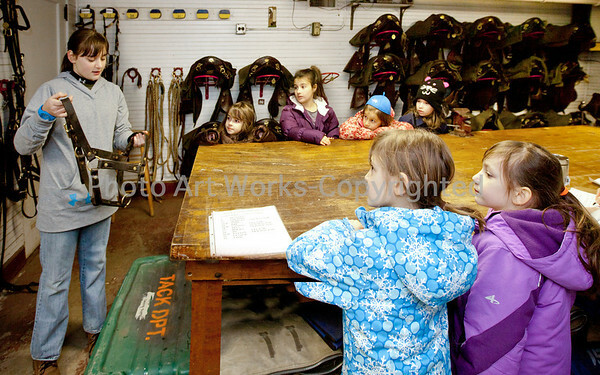 The Girl Scout Daisy Troop 50762 from Sandy Hook, CT were very excited when they arrived at The 2nd Company Governor's Horse Guard to learn about, and to meet some of the horses. They began their tour of the barn in the tack room where they were told what horses wear by Haley Taylor. Haley is an experienced rider, and daughter of one of the Troopers. This was followed by a peek outside to see the horses in the pasture. After that it was feeding time for all of the horses who were brought inside and put in their stalls. The Girl Scouts fed many of horses carrots, then had fun meeting, and brushing Patton. Please contact Marleen, the photographer directly to order prints.